Combine camping with horseback riding and you have the materials to make the memories of a lifetime. A great way to improve horsemanship while having a great time is to play games on horseback. Games for horse camps are an absolute must. The kids will be learning without even knowing it. This game teaches balance and leg position, as well as improves riding overall. Each rider takes one dollar and places it under their thigh while riding. The riders are then asked to do various gaits and exercises until all but the winner has lost their buck. The winner gets and award and gets to keep all the bucks. The rider must balance a raw egg in a spoon while riding her horse. The riders are disqualified one-by-one until only the winner is left. This game can be a lot of fun as riders struggle to find ways to balance their egg while riding. Putting together an obstacle course for horses and their riders can be as much fun for the people putting it together as for the riders who try to make it through the course. The goal is to create a course that will challenge the horse and rider to negotiate a series of obstacles safely, and with the fewest number of mistakes. Which Horses Have the Best Temperament? 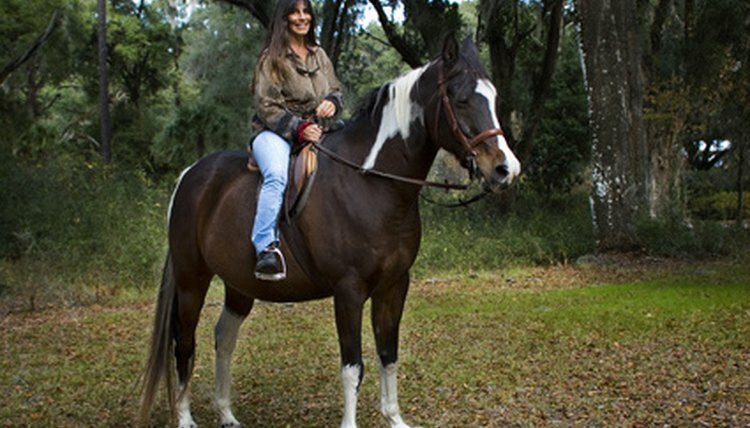 How Long Do You Wait Before You Train a Horse to Be Ridden? What Kind of Horses Are Pacers & Trotters?